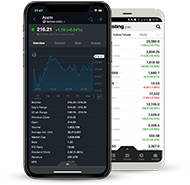 Investing.com’s real-time charting tool is a robust, technically advanced resource that is easy to use, so it’s intuitive enough for beginners but also powerful enough for advanced users. You can search for and select thousands of instruments via the input field – stocks, indices, commodities, currencies, ETFs, bonds, and financial futures. In addition, you can compare different instruments on the same chart. The tool offers multiple chart types, flexible customization options and dozens of technical indicators and drawing tools. Live charts can be viewed in full-screen mode and can be shared via the screenshot-button. For your comfort, templates may be saved and reloaded. Sign In / Free Sign Up now to save your chart settings. To hide/show event marks, right click anywhere on the chart, and select "Hide Marks On Bars".